All of the following accessories fit the Vapor Rino 145 PSI Vapor Steam Cleaner + VS-900-Mobile, VS-900-C-RIC, VC-4000-C, VC-5000-Ci Except where specified otherwise. Replacement Accessory: Sold in packs of 10 brushes. Please call if you desire other quantities. This Nylon bristled brush is approximately 1 inch wide and tall. 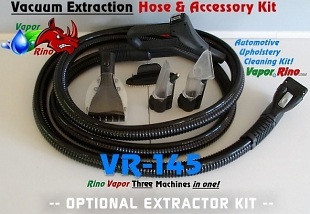 Used with the Vapor Rino 145 PSI, Chemical Injection vapor steam cleaner. Fits both the 120v and 240v versions. This brush fits on the detail nozzles. Will fit either the single hole or the three hole nozzle. Perfect for cleaning grout, tile and other detail work. The nylon is one of the softest of the brushes only surpassed by the horse hair brush. Great for most surfaces and less likely to scratch then the metal brushes. Replacement Accessory: Sold in packs of 10 brushes. Please call if you desire other quantities. This Brass bristled brush is approximately 1 inch wide and tall. Used with the Vapor Rino 145 PSI, Chemical Injection vapor steam cleaner. Fits both the 120v and 240v version. This brush fits on the detail nozzles. Will fit either the single hole or the three hole nozzle. Used for some grout cleaning, cleaning grills, commercial kitchen equipment, rusty metal and more. The Brass is the second hardest brush just under the stainless steel brush. A fantastic brush when used right. Use caution, it may scratch surfaces. Replacement Accessory: Sold in packs of 10 brushes. Please call if you desire other quantities. This Stainless Steel bristled brush is approximately 1 inch wide and tall. Used with the Vapor Rino 145 PSI, Chemical Injection vapor steam cleaner. Fits both the 120v and 240v version. This brush fits on the detail nozzles. Will fit either the single hole or the three hole nozzle. Used for grout cleaning, cleaning grills, commercial kitchen equipment, rusty metal and more. The Stainless Steel is the hardest of all the brushes. A fantastic brush when used right. Use caution, this will scratch surfaces. Replacement Accessory: Sold in packs of 10 brushes. Please call if you desire other quantities. This beautiful, natural Horse Hair bristled detail brush is approximately 1 inch wide and tall. Used with the Vapor Rino 145 PSI, Chemical Injection vapor steam cleaner. Fits both the 120v and 240v version. This brush fits on the detail nozzles. Will fit either the single hole or the three hole nozzle. Used for fine cleaning where a soft touch is needed. These natural horse hairs are soft and gentile. They are clustered tightly providing a much finer and more complete cleaning of many surfaces. Popular in auto detailing as well as many other applications where not scratching is important! Replacement Accessory: Sold individually. This beautiful, natural Horse Hair bristled brush is approximately 2 3/4 inches wide and round. Used with the Vapor Rino 145 PSI, Chemical Injection vapor steam cleaner. Fits both the 120v and 240v version. This brush fits on the detail nozzles. Will fit either of the single hole nozzles. It is designed with two settings when used with the 3 hole detail nozzle. Used for fine cleaning where a soft deep scrubbing action is needed. Natural horse hairs is soft & gentile. Clustered tightly providing a much finer & more complete cleaning of many surfaces. Popular in the auto detailing & other jobs where not scratching is important! Replacement Accessory: Sold individually. This beautiful, natural Horse Hair bristled brush is approximately 3 inches wide & triangle. Used with the Vapor Rino 145 PSI, Chemical Injection vapor steam cleaner. Fits both the 120v and 240v version. This brush fits on the detail nozzles. Will fit either of the single hole nozzles. It is designed with two settings when used with the 3 hole detail nozzle. Used for fine cleaning where a soft deep touch is needed. Our natural horse hairs are soft & gentile. They are clustered tightly providing a much finer & more complete cleaning of many surfaces. Popular in the auto detailing & other applications where not scratching is important! Replacement Accessory: Sold individually. This Nylon bristled brush is approximately 2.75 inches wide & round. Used with the Vapor Rino 145 PSI, Chemical Injection vapor steam cleaner. Fits both the 120v and 240v version. This brush fits on the detail nozzles. Will fit either of the single hole nozzles. It is designed with two settings when used with the 3 hole detail nozzle. Used for cleaning where a deep scrubbing is needed. These nylon bristles are safe on most surfaces. Great for scrubbing counter tops, sinks, toilets, kitchens, tile, tires and much more. Popular in auto detailing as well as many other applications where a low probability of scratching is important. Replacement Accessory: Sold individually. This Nylon bristled brush is approximately 3 inches wide & triangle. Used with the Vapor Rino 145 PSI, Chemical Injection vapor steam cleaner. Fits both the 120v and 240v version. This brush fits on the detail nozzles. Will fit either of the single hole nozzles. It is designed with two settings when used with the 3 hole detail nozzle. Used for cleaning where a deep scrubbing is needed. The shape of the brush makes it easier to get into corners. Great for scrubbing counter tops, sinks, toilets, kitchens, tile, tires & much more. Popular in auto detailing as well as many other applications where not scratching is important. Replacement Accessory: Sold individually. This Tough Stainless Steel bristled brush is approximately 3 inches wide & triangle. Used with the Vapor Rino 145 PSI, Chemical Injection vapor steam cleaner. Fits both the 120v and 240v version. This brush fits on the detail nozzles. Will fit either of the single hole nozzles. It is designed with two settings when used with the 3 hole detail nozzle. Used for cleaning where a deep abrasive scrubbing is needed. The shape of the brush makes it easier to get into corners. Great for scrubbing rusty metal, baked on commercial kitchen grime and more. Great for any application that needs our stiffest brush where scratching is not an issue. Replacement Accessory: Sold individually. This Brass bristled brush is approximately 2.7 inches wide & round. Used with the Vapor Rino 145 PSI, Chemical Injection vapor steam cleaner. Fits both the 120v and 240v version. This brush fits on the detail nozzles. Will fit either the single hole nozzle. It is designed with two settings when used with the 3 hole detail nozzle. Used for cleaning where a deep abrasive scrubbing is needed. The shape of the brush is great for circular scrubbing. Great for scrubbing rusty metal, baked on commercial kitchen grime and more. Great for any application that needs a stiff brush and scratching is not an issue. Brass is softer than steel. Replacement Accessory: Sold individually. This THREE HOLE Nozzle is designed to work with the medium brushes shown above. Used with the Vapor Rino 145 PSI, Chemical Injection vapor steam cleaner. Fits both the 120v and 240v version. The 3 hole design married with the architecture of the Medium Round and Medium Triangle brushes make this a multi function tool. Twist a medium brush to the right and the steam spirals out of the bottom of the brush creating a dense hot and moist steam. Perfect for thousands of uses. Twist the brush to the left & the steam comes out in a 3 way jetting pattern providing more of a blasting action. A great tool & a must have. Replacement Accessory: Sold individually. This black plastic Short Black SINGLE HOLE Nozzle is approximately 5" long & designed to work with all the medium brushes as well as the detail brushes. Used with the Vapor Rino 145 PSI, Chemical Injection vapor steam cleaner. Fits both the 120v and 240v version. This nozzle is ideal with a brush or without. Great for jetting into tight spaces, blasting grime off a surface followed by a wipe with a cloth. It is typically one of the most used tools in any vapor steam kit. A great tool & a must have. This nozzle, like the other nozzles attaches right to the steam gun or at the end of any of the extension poles. Replacement Accessory: Sold individually. This Long Metal shaft SINGLE HOLE Nozzle is approximately 11" long & designed to work with all the medium brushes & the 1" detail brushes.. Used with the Vapor Rino 145 PSI, Chemical Injection vapor steam cleaner. Fits both the 120v and 240v version. The single hole is ideal with a brush or without! Great for jetting into tight spaces, blasting grime off a surface followed by a wipe with a cloth. This extra long attachment makes it easy to reach under car seats or other tight spaces. The single hole nozzle is a must have tool. This nozzle, like the other nozzles attaches right to the steam gun or at the end of any of the extension poles. Replacement Accessory: Sold individually. 18 Inch Long Extension Pole. Unlike most other brands we offer True commercial accessories. Our stand and clean commercial vapor steam cleaner poles are made of high quality insulated aluminum, not cheap plastic! They are rough and tough just like our steam cleaning contractors. LONG POLE: These long 18" poles are the same as the ones that come standard with our Vapor Rhino series steam cleaners. If you are tall or need to reach above your head you can attach a third pole. Weather you are very tall or just want to replace one of your old poles, these commercial quality vapor steam cleaner extension poles are a must have. Fits both the 120v and 240v version. Replacement Accessory: Sold individually. 9 Inch Short Extension Pole. As you can see we offer TRUE commercial accessories. Our stand & clean vapor steam cleaner poles are made of high quality insulated aluminum, not cheap plastic! SHORT POLE: This short pole allows you to put accessories on it for those in between length reaches. I am 5'10" tall. The two standard 18" poles together are fine however, I love putting the 9" pole on them. This give me a nice 45" reach allowing me to stand up straight and work comfortably. This is a must have for my kit! Fits both the 120v and 240v version. Replacement Accessory: Sold individually. Large Triangle Brush W/Clips for cloth. This is a fantastic heavy duty tool! It is both a steam scrub brush & a hand held steam mop. Putting on a cloth transforms it into great sanitary, super heated hand held steam mop. Great for hard surfaces & upholstery & when done right, leather. It has a locking swivel on the back that allows the brush to be locked straight or unlock so it can tilt and glide under furniture. A must have tool for your accessory kit. Highly recommended. Comes standard with most of our steamers. Commercial quality. Great for auto detailing, janitorial work, sanitizing surfaces, mopping or scrubbing behind toilets and much more. Fits both the 120v and 240v version. Replacement Accessory: Sold individually. Window / Glass Cleaner / Hard Surface Squeegee. This great tool comes standard with most of our steam cleaner packages. A simple tool that attaches to your steam gun or to the end of an extension pole. Can be used on glass, mirrors, commercial kitchen stainless steel walls and table tops. Along the rubber squeegee edge is a series of approximately 15 steam ports that jets out dry vapor steam. You can pre-mist the surface to moisten it with the steam or just steam while you squeegee. An important part of any true commercial vapor steam cleaner kit. Fits both the 120v and 240v version. Replacement Accessory: Sold individually. Approximately 11.5" wide Large Floor Brush With Mop Clips & Carpet Glide. This wonderfully designed professional steam cleaner accessory is a multi-use tool. It fits on the gun or an extension pole. It has a removable carpet glide that allows you to effortlessly sanitize carpeting and bedding. Use the built in clips to attach a cloth and it becomes a commercial vapor steam mop. Remove the carpet glider and it becomes a large multi port steam scrub brush. Flip it over and you will find it has a built in squeegee edge for clearing floors and other hard surfaces. Includes a swivel head. A quality took that may last a lifetime! Fits both the 120v and 240v version. Replacement Manual: FREE. Have you lost your manual? Can't find it? No problem. You can download it to your computer desktop or print it out for FREE right now. Want to take a peek before you buy the Vapor Rino 145 PSI Commercial vapor steam cleaner? Just open and browse over the manual. Want the newest version of our manual? Just stop back in and click away! Easy, fast & powerful. Vapor Rino! PLEASE NOTE: Only works with Vapor Rino, 145 PSI Systems purchased AFTER September 2016! Includes Both 120 and 230 volt units. ALSO: A suction source meaning a Vacuum or Extractor is NOT included. You will need to use your own wet/dry vacuum.